"A recipe that has been in my family for years. It's bound to make your meal a success!" Place the zucchini and onion in a pot with the water. Bring to a boil, reduce heat to low, and simmer 15 minutes, until tender. Drain, cool, and mash. Mix in 2 tablespoons butter, horseradish, salt, and pepper. Preheat oven to 350 degrees F (175 degrees C). Lightly grease a 1 quart baking dish. Melt remaining 3 tablespoons butter in a saucepan over medium heat, and stir in the cracker crumbs until golden brown. Mix the egg into the mashed zucchini mixture. Scoop the into the prepared baking dish, and top with the cracker crumbs mixture. Bake 30 minutes in the preheated oven, until topping is crisp. 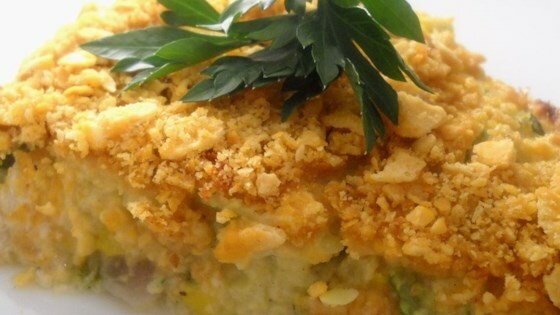 Sliced vegetables bake with a creamy, cheesy sauce and crunchy bread-crumb top. This is a great summer time dish! I recommend putting more spices than just salt and pepper and maybe a table spoon more horseradish. Other than that I love it! A recipe with potential. Not something my family cared for. I thought this was fantastic!! A great way to use up and abundance of zucchini. We liked this, although I did double the horseradish and could have added even a little more. I think garlic would be a good addition, too.